The one single factor between a vehicle and the nation’s network of roads and highways are its tires. Tires transfer the engine’s torque and the driver’s control to the road surface to provide traction and directional control. The proper tires, in good conditions, are essential for safe driving—from compact cars to the largest highway haulers. Commercial vehicle operators have a special relationship with their vehicle’s tires. Tires are expensive, but fines and other costs for operating with a faulty or unsafe tire can be significantly more costly. Each state/province has a set of laws that describe specific tire requirements such as tread wear and condition, as well as the use of winter (snow and ice) traction devices such as studded tires and chains. Failure to adhere to these laws can result in costly fines, lost time, and, worst of all, contribute an accident. A review of the associated list of state regulations indicates that the states are concerned about pneumatic, solid rubber, and metal “tires.” Solid rubber tires are typically used on specialized equipment and are not permitted for used on over-the-road trucking. Metal wheels are typically limited to farm equipment or industrial uses and are not permitted on highways. That leaves the basic air-inflated (pneumatic) tire to carry the load. Every vehicle manufacturer identifies a specific type and rating for its vehicles’ tires. The tire type is determined by vehicle weight and the type of driving anticipated for the vehicle. Size and ratings for each tire are molded into the side of the tire. It important to ensure that all tires on a vehicle carry the appropriate size and rating. Finally, mismatched tires on a vehicle can lead to excessive and uneven tire wear as well as changes in the control and handling of the vehicle. Typical tractor trailer trucks traveling on the Interstate and other national highways are limited to 80,000 pounds gross vehicle weight, typically with 12,000 pounds on the steering axel and 34,000 pounds per dual axel group. A typical tire size is 11R22.5. The first two digits, “11” indicate the tire width of 11 inches. Pounds-per-inch of tire width provides both an indication of tire traction and a measure of load restriction based on rated tire capacity. The pounds–per-inch of tire width are determined by dividing the weight carried on the axle group by the number of tires in the group and dividing that by the manufacturer's rated tire width as indicated on the sidewall of the tire. 34,000 lb. / 8 = 4250 lb. per tire / 11 in. = 386 lb. per in. In this example, each tire would have to be rated for a load of at least 4250 lb. Most commercial truck tires are rated for weights well in excess of 5,000 lb. For example, a typical new 11-in. wide drive axle tire (Uniroyal LD10) is rate at 6,000 lb. for dual axle applications, or 545 lb. per inch. In a single-tire application, e.g., the steering axel with a maximum weight of 12,000 lb., each 11 in. wide tire would have to carry 6,000 lb. or approximately 545 lb. per inch. States may limit tire loads on the Interstate System, but not to less than 500 pounds per inch of tire or tread widths. Tire load limits may not be applied to steering axles (but steering axle tires must be rated to carry the actual weight of the steering axle). The most obvious concern for vehicle operators is tread wear that indicates when the tire should be replaced. Most states require a minimum tread depth of at least 2/32 of an inch. Most modern ties have wear indictors built into the tire that indicate when the tire tread has reached the 2/32 mark and should be replaced. Several states require 4/32 tread depth on front (steering) wheels since tread depth directly affects controllability. Tread wear indicators provide an immediate indication of tread wear. Other easily spotted problems with tires include excessive wear or damage where tire cord is visible, under inflated tires, cuts and cracks in the tire and tire sidewalls, bumps or bulges anywhere on the tire, and damage around the edge of the tire bead between the tire and wheel. The tire should meet the requirements for the vehicle based on the tire labeling. Finally, do not mix radial and bias ply tires. The two types of tires handle and perform differently and can result in poor, unpredictable, and unsafe handling under different conditions. All of these are items make visual evaluation of a tire’s condition relatively easy for a law enforcement officer during an inspection station or a traffic stop. A tire is flexible, and the area in contact with the road surface, the “tire patch,” flattens out, providing the grip the tire is designed to deliver. If the tire is over inflated, the contact patch is smaller providing less friction than a properly inflated tire. An under inflated tire has a greater contact area but flexes the tire more than the tire is designed to take and can increase wear. The greater area also increases the possibility of hydroplaning on wet roads. Again, tires should be inflated to the manufacturer’s specification for best performance. Tire pressures should be checked periodically—usually every thirty days, although commercial truck drivers are expected to check pressures prior to each day’s run. Tire pressure should be checked using a tire pressure gauge. Kicking a tire or using a tire thumper may indicate a tire that is flat or nearly flat but may not identify a seriously under inflated tire. Snow and ice can cancel the traction normally provided by the tire tread. The two most common means to provide traction on ice and snow are the use of tire chains or studded winter tires. Chains are designed to be put on when encountering snowy, icy conditions, and taken off when not needed. Studded tires have short metal or ceramic pegs that stick out of the tire and grip into the snow or ice. They can be driven on clear roads, but the studs tend to damage the pavement. Year-round use is prohibited. Each state posts dates when studded tires may be used, and when they have to be removed from the vehicle. 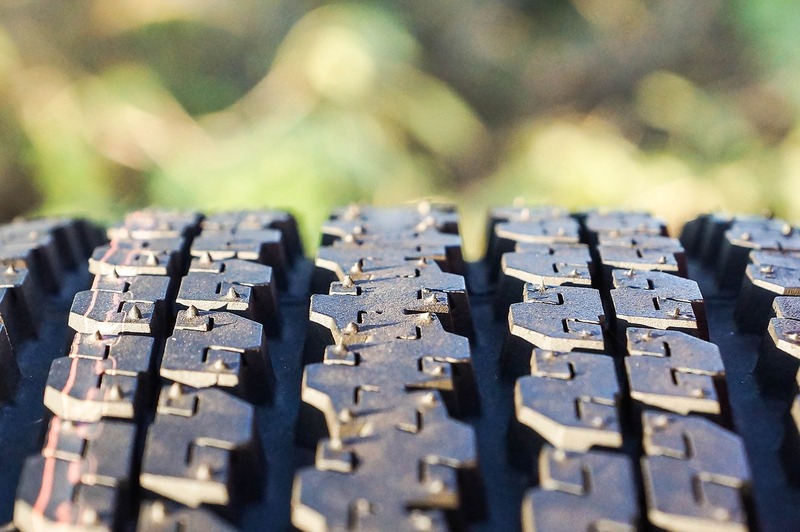 Studded tires are suitable for only lighter vehicles with gross weights up to 7,000 to 10,000 pounds. Heavier vehicles should use chains when needed. States may also specify which wheels on commercial trucks must have chains—usually at least two drive wheels, Possibly on some trailer tires, and also on steering wheels. As indicated, it is relatively easy for a law enforcement officer to detect excessively worn, damaged, or underinflated tires. Police are empowered to issue citations for violations of tire regulations, and in most states the citation is a misdemeanor. The fines are not excessive but may add up with additional court costs. And, of course, there will be cost and inconvenience of an unscheduled stop to change the tire. Additionally, there are the potential costs associated with tires that blow out while in motion. If this occurs when there is traffic around, and someone is injured, or their vehicle is badly damaged, there are a growing number of law firms eager to win huge settlements for those clients. For commercial truckers, properly inflated and maintained tires may last 200,000, 300,00 miles or more. Regular (daily) inspection of tread wear, tire condition, and inflation will allow operators to get the most mileage out of their tires without the added costs of roadside tire service, or worse. Consult the associated document that summarizes each state’s laws and regulations for tires and tire conditions.